Rhinestone Studded Adjustable Ladybird Ring. Quirky, clear rhinestone studded, ladybird, stretch ring. This is a quirky, unusual clear rhinestone studded ring. 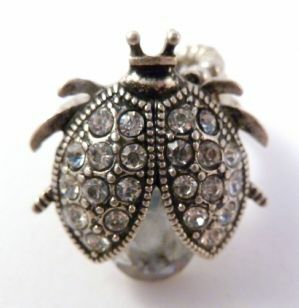 The ring design features a clear and large rhinestone studded beetle/ladybird with partially opened wings. It's a striking modern piece in excellent condition. The ring has an adjustable stretch back and will fit most fingers. Decorated with clear rhinestones, set in silver tone metal.. Striking large modern insect ring.